Entitled, “Ensuring Justice for Syria”, the session was chaired by H.E. Sheikh Mohammad bin Abdul Rahman Al Thani, Minister of Foreign Affairs of Qatar, and H.E. Ms. Aurelia Frick, Minister of Foreign Affairs of Liechtenstein. The event was also attended by the UN High Commissioner for Human Rights Ms. Michelle Bachelet and Ms. Catherine Marchi-Uhel, Head of the International, Impartial and Independent Mechanism (IIIM). 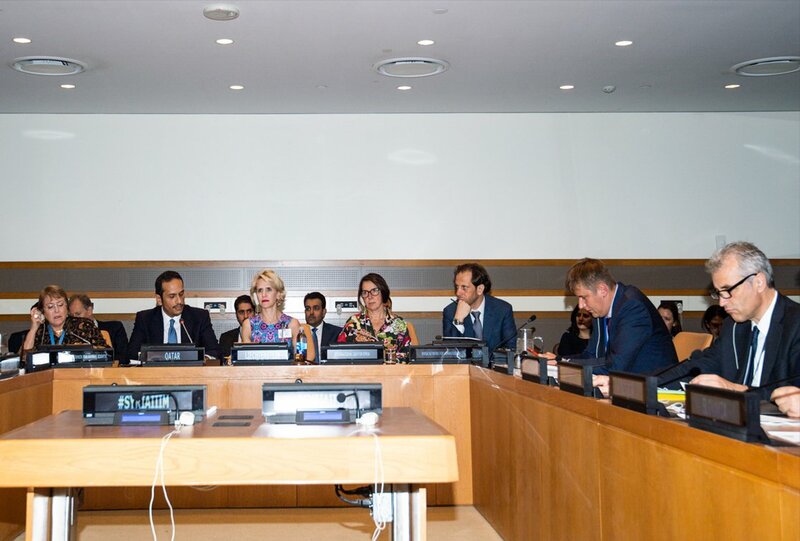 Among the attendants were also a wide range of foreign affairs ministers, as well as delegates of permanent state members at the Security Council, primarily states who support the IIIM and the path of accountability in Syria. Sheikh Al Thani, Qatar Minister of Foreign Affairs, stressed his state’s sustained support for the IIIM in light of the Security Council’s failure to achieve any form of accountability of those who committed crimes in Syria, stressing that the IIIM should cooperate with local society organizations in Syria. Frick, Minister of Foreign Affairs of Liechtenstein, spoke next about the establishment of the IIIM and stressed that states should support the Mechanism and provide and share data. She added that the IIIM has paved the way to hold the criminals accountable in Syria, especially that the Syrian regime has started to issue death documents that call for the urgent intervention of several states. The UN High Commissioner for Syria shed light on the magnitude of the egregious violations that have been committed against the Syrian people, including the use of chemical weapons by the Syrian regime and ISIS, and how none of the parties involved in the conflict has yet to hold any individual who was involved in violations accountable. The Head of the IIIM took the floor next, speaking about the difficulties and the accomplishments of the IIIM, while shedding light on its most recent report that was submitted to the UN General Assembly in August. One of the most notable accomplishments of the IIIM, she noted, was developing complex programs that enable the IIIM to store large volumes of pictures and videos securely and safely, as well as making great progress in accelerating the collection of data from international and local organizations, as well as states. She also touched upon the agreement reached with the Commission of Inquiry which enabled the IIIM to access information and data from the Commission of Inquiry, where the IIIM can now, using the capabilities and information it has, assist with cases that are being worked on at European states’ courts with universal jurisdictions. Moreover, she revealed that the IIIM are preparing two lawsuits that are set to be announced by the end of the year. The IIIM, she added, has also signed an agreement with the OPCW which will allow the IIIM to access the materials possessed by the OPCW as well. As for working with Syrian civil society organizations and challenges, she said that the IIIM needs to hire 40 individuals by the end of the year, including Arabic-speaking individuals. Marchi-Uhel, Head of the IIIM, concluded her speech by highlighting budgetary challenges, revealing that they have a shortage in their budget for 2019, and called for more financial support from states, as well as sharing the information they have on violations and victims.